The Kos parasite has no requirements other than 20 arcane. It's a big investment, but this is a weapon intended for characters heavily focused on this stat and aiming to take advantage of its impressive scaling. When equipped, nothing will appear to change. This would lead many to assume that the weapon is useless; but this is far from the truth. The true power of the Kos Parasite is revealed when used in combination with the Milkweed Rune. 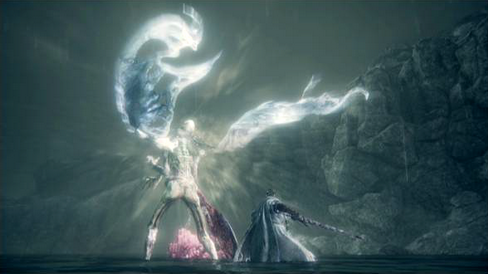 The Kos Parasite is an arcane weapon in the purest of senses. All of its attacks deal solely in this damage type. On top of its already excellent scaling, its damage multipliers are usually close to, or even double the weapon's attack rating! Even so, you may have trouble dealing sufficient damage to enemies with high arcane defenses, or players using the Loch Shield, so this weapon is not ideal for all situations. Normal Mode: Attacks are slow in normal mode, and chain into each other at an equally sluggish pace. It's useful against enemies with low to no super armor, but can otherwise leave you open during attacks. Take note that its stamina use is much more reasonable in comparison to the transform mode. This only highlighted by the similar damage output between them. Transformed Mode: The Kos Parasite's attacks are much better in transform mode. While still quite slow, they receive a good increase in reach. One of the main downsides to using this mode is in its stamina to use. It lacks a charged R2, so you'll need to use the normal mode for to use rear visceral attacks. It also requires the use of both hands, so frontal visceral attacks are out the question as well. The Kos Parasite is already an elemental weapon, so it can't be buffed with items or converted to another damage type with gems. Don't bother with Tempering gems as these will have little effect. Instead, think about increasing your arcane damage with Arcane and Odd Arcane gems. The Kos Parasite uses a lot of stamina while transformed; especially if you are using evasive attacks, such as quickstep R1s. A way you can lessen this is by slotting radiant gems. If you often find yourself using the projectile vomit attack, you may want to consider slotting Murky gems to increase your poison buildup. Since this will add buildup to all of your attacks, you can poison. For more information check the Best Blood Gem Setups page. Normal Mode: The Kos Parasite's R1 fill chain is slow with low reach. The first two hits swing horizontally, but aren't particularly wide or good against crowds. Really, you'll want to use the rolling and quickstep R1s for damage. These will send a wriggling tentacle a solid span forward, which hits multiple times. These attacks are useful for evasive play, which may be necessary against enemies with high super armor. The backstep R1 will cause your character to projectile vomit forward. It will do relatively low damage on impact, but its main purpose is to poison enemies. This can be a bit impractical to use as it will usually land at the origin point of your backstep. However, by unlocking and angling the camera upwards, you can increase the distance your vomit travels! A fully charged R2 takes a while to perform, but can stagger opponents from behind. It has pretty good range, so you can use it for sneaking up on enemies. On the other hand, its second hit can miss if you're not close enough, so you don't want to stand too far from your target. Transformed Mode: The R1 chain is much more useful this time around. The ranges of these attacks are increased in this mode, and the third hit finishes off with heavy impact. Rolling and quickstep R1s also see improvements in reach, but use more stamina and do less damage. You can still use the backstep R1 to vomit on enemies, but it costs a lot more stamina, so you're better off using this attack in normal mode. The R2 is one of the best attacks you can use in this mode. On top of having great range, it strikes with high damage and massive impact. Although this consumes a lot of stamina, you can use its length to even further distance yourself for hit-and-run tactics. An even better attack you can use is the dashing R2; it has similar reach, does better damage, but requires more stamina. Since you need some space to get the dash going, it works best as an opening attack. A single use of the L2 will do slightly more damage than a full R1 chain. This attack is a large, multi hit area of effect explosion that consumes two bullets when used. The startup is slow, so you'll need to careful about when you use it, especially against foes with high super armor since they may continue attacks through the initial hits. Another thing to keep in mind is your bullet count. Without enough bullets, this attack will attempt and fail which can leave you wide open for a period of time. To use this weapon you must have the Milkweed Rune on (it is obtained by Saint Adeline, the woman in the chair asking for Brain Fluid in the Research Hall - the room to the right of the lamp). You give her 3 Brain Fluid and she will give you the rune. Durability of the weapon depletes when used. This means hitting an enemy, destructible object or bouncing off the walls. Hitting undestructible objects and environment does not deplete your durability. Style of an attack or upgrade of the weapon, even different weapon, does not matter - each count as one hit. Every 10th hit against the enemy/object depletes 1 durability. Exception is Tonitrus, which when in self buffed mode, depletes durability at rate of 2 hits. Hitting an enemy in dying animation still counts as hit. Also hitting multiple enemies/destructible objects at once counts as one hit per enemy - hitting 3 enemies at once counts as 3 hits towards durability counter. Shields lose 1 durability every 10th hit. Bounce means when your hit is bounced back off the wall or other objects. Every 5th bounce depletes 1 durability. Not every weapon can be bounced off, Kos Parasite belongs into the category which cannot. Damage reduction when heavily worn. When weapon is at 30% of total durability, it reaches the Risk state and AR is reduced by 30% and when it hits 0% of total durability, weapon is Broken, then AR is reduced by 50%. 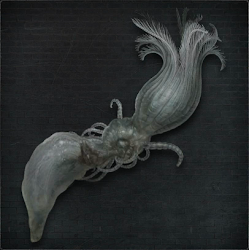 Kos Parasite which has 600 points of durability reaches risk state at 180 Dur. Workshop's Repair: cost of repair depends on the weapon and its upgrade. For Kos Parasite +0 it's 1 Blood Echoes per 1 point and for Kos Parasite +10 it's 2 (values are rounded), full repair costs for +10 are 1400 Blood Echoes. 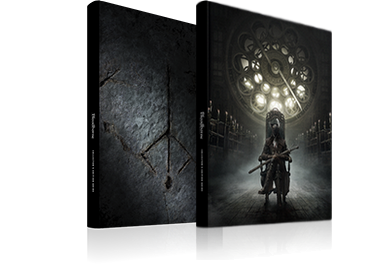 Note: Damage Multiplier data taken from http://darksouls2verificationdata.web.fc2.com/motion-bloodborne.html after patch 1.09.